Photo Credit: The Rooms Provincial Archives MG 956.110 Item consists of sheet music, lyrics, and illustrated cover for patriotic composition, Newfoundland. On left side a seal fisherman in oilskins holding Newfoundland pink, white and green with seal at his feet on right side a uniformed Royal Naval Reserve member, holding Union Jack, with Newfoundland dog. The song the “Newfoundland” now known as the “Ode to Newfoundland” was sung for the very first time on January 21, 1902 at the Casino Theatre, 33 Henry Street, St. John’s. The local St. John’s newspaper, The Daily News, reported that the new song was greeted enthusiastically. The “Ode to Newfoundland” was composed by Governor, Sir Cavendish Boyle, the original score was set to the music of E.R. Krippner, a German bandmaster living in St. John’s but Boyle desired a more dignified score. It was then set to the music of British composer Sir Hubert Parry, a personal friend of Boyle, who composed two settings. The “delicacy’ was that Governor Boyle was both author of the Ode and Governor, it simply did not look proper that he sign off on his own Ode. The Premier of the day, Sir Robert Bond, determined that the Ode become the official anthem suggested that given the hesitation of Governor Boyle that approval be given by the Hon. W.H. Horwood, C.J. , Administrator of the Government. But it was not to happen. By 1904, the ‘Newfoundland’ had become firmly established, in the minds of most people, as the “official anthem” of the Dominion of Newfoundland, there was no Government function without the ‘Newfoundland’, it was sung at most public gatherings, in parish halls and concert halls. It was so firmly established that in the 1909 General Election, Robert Bond proposed that if elected he would be certain to make it the “official” anthem of the country. “The poem commonly called the Ode to Newfoundland, composed by Sir Cavendish Boyle, Governor of Newfoundland from 1901 -1904, as it appears in the schedule is adopted as the provincial anthem of the Province of Newfoundland and shall be officially known and recognized as the Ode to Newfoundland. On August 17, 1979, Royal Assent was given to legislation adopting the Ode to Newfoundland as the official provincial anthem of the province of Newfoundland. We love thee, smiling land. We love thee, we love thee, we love thee frozen land. We love thee, frozen land. We love thee, windswept land. Recommended Book: “We Love Thee Newfoundland” Biography of Sir Cavendish Boyle, K.C.M.G. Governor of Newfoundland 1901 -1904 by Frank W. Graham. Creative Printers, St. John’s, 1979. Recommended Reading: Geoff Butler, Ode to Newfoundland. Lyrics by Sir Cavendish Boyle. Toronto: Tundra Books, 2003. This entry was posted in Archival Moments and tagged Casino Theatre, Cavendish Boyle, Francesy Foster, Hubert Parry, Krippner, Ode to Newfoundland, Spindrift, The Ode on January 20, 2019 by Larry Dohey. The song the “Newfoundland” now known as the “Ode To Newfoundland” was sung for the very first time on January 21, 1902 at the Casino Theatre in St. John’s. The local St. John’s newspaper, The Daily News, reported that the new song was greeted enthusiastically. This entry was posted in Archival Moments and tagged Casino Theatre, Cavendish Boyle, Francesy Foster, Hubert Parry, Krippner, Ode to Newfoundland, Spindrift, The Ode on August 16, 2018 by Larry Dohey. Photo Credit: The Rooms Provincial Archives MG 596 -110 sheet music, lyrics, and illustrated cover for patriotic composition, Newfoundland. On January 22, 1902, the local St. John’s newspaper, The Daily News, reported that on the previous evening at the Casino Theatre in St. John’s that the “Newfoundland “ now known as ‘The Ode To Newfoundland’ was sung for the very first time. The new song was greeted enthusiastically. The “Ode to Newfoundland” was composed by Governor, Sir Cavendish Boyle, the music for the Governor’s poem was arranged by Professor E.R. Krippner. The words have since become etched in Newfoundlanders’ collective memory. We love thee, wind-swept land. 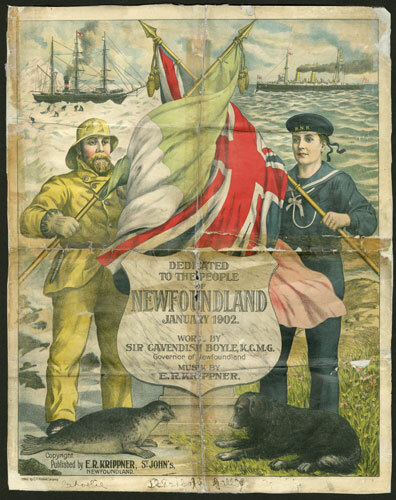 Recommended Archival Collection: At the Rooms Provincial Archives Division take some time to look at MG 956.110 this item consists of sheet music, lyrics, and illustrated cover for patriotic composition, Newfoundland. Recommended (Children) Reading: Ode to Newfoundland – Geoff Butler an illustrated book celebrating the land, seascapes, people, and traditions of Newfoundland. This entry was posted in Archival Moments and tagged Casino Theatre, Cavendish Boyle, Ode to Newfoundland, Professor Krippner, Spindrift, St. John's on January 20, 2017 by Larry Dohey.